The Musician’s Friend deal of the day (with the catchy name of “Stupid”) runs a bit different from most other retailers offering daily deals in that they do not run for a calendar day but rather for a 24 hour window that spans two calendar days. So the Tuesday daily deal is good until Wednesday JAN-30-2019 at 8am eastern (or earlier if sold out) and it just happens to be a budget studio headphone, it is the new condition closed-back over-ear Tascam TH-2090X going for $30 with free shipping. While the Braiwavz HM5 are a 6-hour lightning deal starting at 10:35am ET today, on the more budget side of studio headphones, the good old Tascam TH-200X (they also go by other brand names) are back on sale again for $30 with free shipping by Musician’s Friend and also available at the same price from their eBay store. There are two speaker daily deals today! Good until Thursday 3am ET, the certified refurbished Klipsch Heritage Wireless The Three Play-Fi Bluetooth Speaker (Ebony) is offered for $340 by Woot with the order fulfilled by Amazon. This is sold on Amazon, not Woot [it can get confusing since most of Woot’s own website orders are also fulfilled by Amazon these days]. Good until Wednesday at 11:59pm ET, on the budget side of things, B&H Photo is offering the new condition Tascam VL-S3 14W + 14W 3″ Powered Studio Monitor (Pair, Black) for $50 with free shipping, which is nice, because speaker shipping is definitely not cheap! UPDATE: also on sale is the new condition Pioneer Elite Audio & Video Component Receiver, black color scheme, model VSX-LX102, for $285 with free shipping by Amazon actual with up to three per customer at the sale price. The closed-back over-ear Tascam TH-MX2 studio headphones are currently on sale for $25 with free shipping at B&H Photo and at Amazon actual with free shipping for Prime members or with a $25+ order. The price of this is $24.99, thus that extra penny needed to get free shipping. The current Musician’s Friend deal of the day running until Sunday at 8am ET (or earlier if sold out) is the new condition Tascam TH-300X studio headphones (closed-back, over-ears) going for $35 with free shipping. These also have “cousin” brands, so google them up if curious or not familiar. The Tascam TH-02 found themselves in some budget headphone recommendation lists and as it happens most of the time, a new model has arrived, it is the Tascam TH-03 (first time I’ve heard about it) and it is now in-stock and shipping for $25 with free shipping by Focus Camera directly or fulfilled by Amazon (Prime eligible), sold by aSavings, which is an online persona for Focus Camera. Good until 8am ET on Monday (or earlier if sold out), the Musician’s Friend deal of the day are the new condition closed-back over-ear studio-ish Tascam TH-200X headphones offered for $20 with free shipping and handling. They average 3.9 out of 5 based on 110+ customer reviews over there. They remind me of other models in looks, like some CAD-branded, but that’s only based on looks. The Musician’s Friend Deal of the Day good until 8am ET on Monday (or earlier if sold out) are the new condition closed-back over-ear Tascam TH-300X studio headphones going for $40 with free shipping and handling. They go by other brand names as well. Back to eBay, the Musician’s Friend eBay store has another sale, the new condition Tascam TH-300X Studio Headphones for $35 with free shipping. Limit up to five units per customer. This looks like an OEM design that goes by various other brand names as well, so use your favorite search engine(s) if you are interested in this. On the budget studio-ish (closed over-ear) headphones front, the new condition Tascam TH-200x are on sale for $30 at Musician’s Friend with free shipping until 8am ET on Wednesday as one of their daily deals. PS: this is not their best price ever, according to the blog archives, they were offered for $19 by both MF and Guitar Center in November 2016. PS2: their style looks familiar, there are other brands that have common ancestry or more, eg CAD-branded headphones but I can’t tell which model matches with which. This Sunday daily deal expired… Yet another daily deal, good until 11:59pm eastern on Sunday, the new condition Tascam HP-VT1 Dynamic Closed-Back headphones go for $13 with free shipping at B&H Photo. They have a 1/4″ connector, not 1/8″ (3.5mm). The Tascam TH-02 closed-back bang-for-the-buck headphones are bundled with the Tascam DR-100 MKIII Stereo PCM Recorder, and two additional freebies, a 32GB Sandisk Ultra SDHC card and the Tascam PS-P520E AC Adapter for Recorders, all together for $430 with free expedited shipping at Adorama.com. The recorder on its own goes for $400, so if you need more than one of the three free accessories, the discounted bundle is a plus. This limited time offer expired… On the budget studio-ish (closed over-ear) headphones front, the new condition Tascam TH-200x are on sale for $19 at Musician’s Friend (free shipping) and Guitar Center (free ship to store or with a $25+ order). This daily deal expired… The main Musician’s Friend Deal of the Day good until 8am ET on Tuesday (or earlier if sold out) is the new condition Tascam TH-300X studio headphones offered for $35 with free shipping. 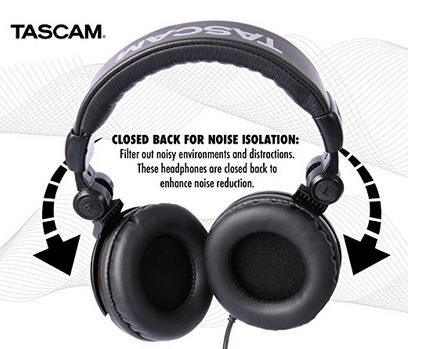 Tascam has a handful of studio-ish headphones, so be sure t research them if you are not familiar with their line-up. This daily deal expired… The headliner of the three Musician’s Friend Stupid Deals of the Day (they have three now instead of one per day) is the new condition closed-back Tascam TH-200X studio headphones offered for $25 with free shipping. The offer ends at 8am ET on Sunday or earlier if they run out of them. This is the second day in a row they have a headphone as one of their daily deals. They also had the BeyerD Custom Studio a few days earlier. A more humble bundle this time, it is the Shure SE-215 in-ears bundled with the TASCAM DR-05 digital recorder, together for $160 with free shipping at Adorama.com. The Shure SE 215 in-ears are bundled with the Tascam DR-05 Portable Handheld Digital Audio Recorder (DAR) for $130 with free shipping at Adorama.com, and they are available with either the black SE-215s or clear SE-215s. This is a limited time offer, it ends 4/21/16 or earlier if they sell out. Back to the budget side of things, the closed-back over-ear Tascam TH02-B, in the black color scheme is continuing to be on sale for $18~ per pair, in new condition, by Amazon actual. It has a folding design and averages 4.2 out of 5 based on 420+ customer reviews. The choking hazard in the listings is the 1/4″ to 1/8″ adapter, the only accessory included. Free shipping for Prime members or with a $49+ order. We can’t have headphone bundles with Audio Technica sneaking in too, the closed-back over-ear M50X are bundled with the Tascam DR-22WL audio recorder, together for $200 with free shipping at authorized dealer for both Adorama.com. This is a limited time offer but I don’t know when it expires. No coupons and no rebates are needed. We have another Audio Technica M40x bundle, this time it is paired with the Tascam DR-05 Portable Handheld Digital Audio Recorder, together going for $120 with free shipping at Adorama. Offer ends by 12/14/15. The Audio Technica M40x is buzzing in the background while the M50/M50x gets all the hype/buzz. But the ones who pay attention, are noticing, and if you are one of them, Adorama has bundled the ATH-M40x with the Tascam DR-05 Portable Handheld Digital Audio Recorder for $115 with free shipping. No coupons, no rebates, just add to cart and continue as usual. Offer ends 11/30/15 or earlier if sold out. The dark green Audio Technica M50x headphones have their bundles as well at Adorama.com, authorized dealers. First up, the M50x are bundled with the Samson MTR101 1″ Diaphragm Studio Condenser Microphone with Shockmount and Pop Filter for $170 with free shipping. Next up, the dark green M50x are bundled with the Tascam DR-22WL 2-Channels Handheld Audio Recorder with Wi-Fi for $190 with free shipping. No coupons, no rebates, just add to cart and checkout. Both offers expire 11/15/15 or earlier if they run out. And now a headphone bundle with something other than Audio Technicas and over-ears. It’s Shure time! The popular Shure SE 215 in-ears are bundled with the Tascam DR-22WL Handheld Audio Recorder for $140 with free shipping at Adorama.com. No coupons, no rebates, just add to cart and sail through. Offer ends 11/15/15 or earlier if they sell out. We have a trio of headphone bundles at Adorama today. We start with the Audio Technica M40x getting bundled with the Mackie CR4 4″ 50W Monitors, together for $160 after a $25 mail-in rebate (details). Even if you don’t want to bother with the rebate, $185 is not a bad price (the speakers go for $150 on their own). Speaking of the speakers, if you want the speakers, don’t like the AT headphones, and don’t want to deal with mail-in rebates, you can get them bundled with the Tascam TH-02 headphones for $150 with free expedited shipping. IF you happen to want the white Audio Technica M50x headphones, and a pair of Tascam VL-S5 studio monitor speakers, and an 88-key Yamaha YPG-535 portable grand keyboard, you can get them all together for $580 at Adorama. The keyboard on its own goes for $500. Optionally, there’s a $30 mail-in rebate. If you do the rebate, it becomes a $550 after $30 MIR. The Musician’s Friend Deal of the Day good until 8am ET (or so) on Wednesday are the new condition Tascam TH-300X studio headphones offered for $40 with free shipping. They average 4 out of 5 based on 36 customer reviews over there at MF. Speaking of daily deals, the Amazon Gold Box deal of the day good until 3am ET on Wednesday is the Denon HEOS 5 Wireless Speaker for $200, with a limit of two per customer. These are SONOS competitors, you don’t need to buy them in pairs – they are not conventional speakers.